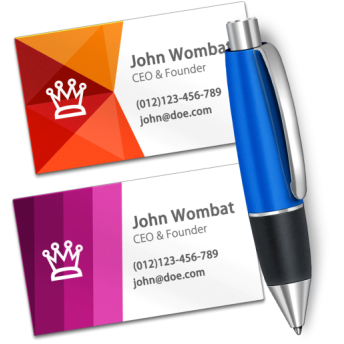 Business Card Designer is the easiest way to create effective business cards. In minutes, you’ll be making great-looking, professional cards — even if you have no previous design experience. Simply drag and drop images, stylish text, 3D text, clip art, and shapes onto a card to get started. Quickly generate and insert QR codes for instant website links. Use the built-in maps navigator to insert a Google map anywhere on your business card. This app supports hundreds of business card paper layouts — including the full line of Avery products — so you can conveniently print your cards at home. Or, export as a high-quality, industry standard PDF or image for commercial printing. Use the “mail merge” feature to automatically populate your cards’ contact info from your Mac OS Contacts (or entered manually). This way, you can create one business card design for your company, and quickly create customized cards for each employee. ● 100+ of professionally designed templates to get you started. ● Support for 500+ types of business card paper layouts, including Avery. ● Easy “mail merge” for auto-populating contact info. ● Import contact info seamlessly from your Mac OS Contacts, or enter them manually. ● 70,000+ high-quality, royalty-free clip art images, free for personal or business use. ● 100+ background textures, art frames, and image masks. ● Insert images, text, vector and raster shapes, clip art, and QR/barcodes. ● Import images directly from iPhoto and Photos apps. ● Choose from a dozen image filters (Vintage, Sketch, Comic, Sepia, and more). ● Adjust image levels, crop, tint, and apply masks. ● Add a Google map with any address or landmark, along with a place marker. ● Insert, style, and rotate 3D text (OS X Yosemite required). ● Vector-based drawing tools (bezier pen, pencil, line). ● Select from 26 vector shapes, or draw your own. ● Style elements with shadows, inner shadows, borders, and reflections. ● Fill elements with colors, radial and linear gradients, textures, frames, or images. ● Change the opacity of any element. ● Layout guides make arranging elements a snap. ● Export to PDF, PNG, JPEG, or TIFF formats.